We wanted to assess whether B-cell and/or T-cell responses to collagen and thereby the course of collagen-induced arthritis could be suppressed by regulatory mechanisms associated with oral tolerance to an unrelated protein. DBA/1 mice were fed ovalbumin (OVA)-containing pellets ad libitum for 1 week and subsequently coimmunized twice, with a mixture of bovine collagen type II (BCII) and OVA in Freund's complete adjuvant. Mice fed OVA before coimmunization with BCII and OVA had significantly lower arthritic scores than mice immunized with BCII only. Their body weight increased during the study period and their anti-BCII antibody activity was significantly IgG2a lower. The frequency of spleen cells producing IgG anti-BCII antibody was also reduced. Coimmunization per se slightly ameliorated the development of arthritis, resulting in an early, transient reduction. It resulted in significantly higher IgG1 anti-BCII antibody activity and increased splenocyte secretion of IFN-γ and IL-10 in response to BCII. Our findings demonstrate that OVA-specific regulatory events induced by feeding OVA, i.e. bystander suppression, reduced the severity of arthritis in animals immunized with BCII and OVA. Anti-BCII specific antibody responses and cytokine secretion by types 1 and 2 T helper cells were also decreased. It is now well established that intestinal exposure to antigen decreases T-cell-mediated inflammation and specific B-cell responses to the antigen in question. This ability of the intestinal immune system has been demonstrated, for example, with respect to antigens such as food proteins  and bacteria . The capacity of the gut-associated lymphoid tissue to suppress certain immune responses to intestinal antigen is known as oral tolerance . Several mechanisms have been suggested to be involved in this process, for instance anergy, clonal deletion of antigen-specific cells, and induction of antigen-specific regulatory cells [3, 4]. Regulatory cells induced by feeding exert their action through secretion of nonspecific suppressive cytokines and/or by direct interactions with other cells [5–8]. Consequently, when the regulatory cells are activated, they suppress immune responses in their vicinity irrespective of the eliciting antigen. It has previously been demonstrated that rats fed ovalbumin (OVA) and subsequently immunized subcutaneously with a mixture of OVA and human serum albumin have significantly lower IgE antibody and lower delayed-type hypersensitivity reactions to human serum albumin than controls . The results of that study provided evidence that rats orally tolerant to one antigen suppressed T- and B-cell responses to an unrelated antigen, provided that the two antigens were injected subcutaneously in a mixture during the inductive phase. Collagen-induced arthritis (CIA) is the most common model for rheumatoid arthritis. Autologous or heterologous collagen type II (CII) emulsified in Freund's complete adjuvant induces arthritis, with edema of the synovial tissue, synovial-cell proliferation, inflammatory-cell infiltration, and erosions of cartilage and bone. The changes are histologically similar to those seen in human rheumatoid arthritis . Previous studies have shown that anti-CII antibodies [10, 11] and CII-specific T-cell responses [12, 13] participate in the pathogenesis of CIA. In the present study, we attempted to suppress the T-cell and antibody response to bovine CII (BCII), and thereby the clinical manifestations of CIA, through OVA-specific regulatory events generated by OVA feeding. Our findings show that DBA/1 mice fed OVA and re-challenged with the same antigen at the time of BCII immunization display reduced T- and B-cell responses to BCII, as well as reduced progression of arthritis. Six- to eight-week-old male DBA/1JBom mice were purchased from M&B (Ry, Denmark) and housed under standard conditions in the animal facilities of the Laboratory of Experimental Biomedicine (Göteborg University, Göteborg, Sweden). The Göteborg University ethical committee on animal experiments approved the experimental protocol. Mice were fed OVA-containing pellets (R380; AnalyCen, Lidköping, Sweden) ad libitum for 1 week to induce tolerance to OVA. The pellets contained 8% (by weight) egg powder, of which 65% is estimated to be OVA . With a calculated food consumption of approximately 2.8 g of food per mouse each day, the daily intake of OVA would be 145 mg per mouse. Control fed mice were given non-OVA-containing standard pellets throughout the experiment. BCII (Chondrex; Redmond, WA, USA) and OVA (Grade V; Sigma, St Louis, MO, USA) were solubilized in 0.1 M acetic acid by gentle stirring overnight, at 4°C. Freund's complete adjuvant was prepared by mixing ground, heat-killed Mycobacterium tuberculosis H37Ra (Difco, Detroit, MI, USA) in Freund's incomplete adjuvant (Sigma) to a final concentration of 2 mg/ml. One week after the last day on the OVA diet, mice were anesthetized with isofluorane and immunized subcutaneously at the base of the tail with a freshly prepared emulsion (100 μl) containing acetic acid, BCII, OVA or a mixture of BCII and OVA (100 μg of each antigen), and an equal volume of Freund's complete adjuvant. A booster injection was given 3 weeks later, with the same antigen(s) emulsified in Freund's incomplete adjuvant. The mice were observed at least twice a week for development of CIA. The severity of arthritis was scored blind, as follows: 0, no disease; 1, mild swelling or redness; 2, swelling and redness; 3, severe swelling and redness. Each paw was graded, so that each mouse could achieve a maximum score of 12. Mice were humanely killed 6 days after the booster immunization and single-cell suspensions were prepared from the spleens. The aseptically collected spleens were stored overnight at 4°C in PBS supplemented with penicillin (100 U/ml), streptomycin (100 μg/ml), and gentamycin (50 μg/ml) (PBS+) (all from Gibco BRL Life Technologies, Rockville, MD, USA). Single-cell suspensions were prepared by passing each spleen through a 70-μm cell strainer (Falcon; Labora AB, Sollentuna, Sweden). The single-cell suspensions were then centrifuged on Ficoll-Paque™ (Amersham Pharmacia Biotech AB, Uppsala, Sweden) for 30 min at 400 gand the mononuclear cell layers were collected. After repeated washes in PBS+, the cells were resuspended in culture medium and the concentration was adjusted to 5 × 106 viable cells per milliliter. The culture medium used for all experiments consisted of Dulbecco's modified Eagle's medium, supplemented with 5% fetal calf serum, penicillin (100 U/ml), streptomycin (100 μg/ml), and gentamycin (50 μg/ml) (all from Gibco BRL Life Technologies, Rockville, MD, USA). Individual spleen-cell suspensions (100 μl, 5 × 106/ml in culture medium) were plated in 96-well round-bottomed microtiter plates and stimulated in triplicate with either 100 μl vehicle (sterile filtered 0.01 M acetic acid diluted 1:10 in culture medium), 100 μl OVA (400 μg/ml, solubilized in 0.01 M acetic acid, sterilized by filtration, and diluted 1:10 in culture medium) or 100 μl heat-denatured BCII (200 μg/ml, solubilized in 0.01 M acetic acid, sterilized by filtration, denatured in 50°C for 30 min, and diluted 1:10 in culture medium). Cells were incubated at 37°C in 5% CO2 for 4 days, and 1 μCi per well of [3H]thymidine was added to the culture for the last 24 hours. Incorporated radioactivity was quantified by harvesting cells onto glass-fiber filters (Printer Filtermat A; Wallac, Turku, Finland) using an automatic cell harvester (Harvester 96 Mach III; Tomtec Inc, Orange, CT, USA) and then treated with melt-on scintillator sheets (MeltiLex A; Wallac) and counted with a scintillation beta counter (MicroBeta TriLux; Wallac). The secretion of IFN-γ, IL-4, and IL-10 by spleen cells after antigen restimulation in vitro was determined by a cell-based ELISA technique . Briefly, individual spleen-cell suspensions were prepared, restimulated, and cultured as described above. After 3 days of culture, the cells were resuspended and transferred (undiluted, or diluted 1:2 in culture medium) to flat-bottomed 96-well ELISA plates (Nunc-Immuno plates; MaxiSorp, Kamstrup, Denmark). The ELISA plates had previously been coated, as recommended, with IFN-γ, IL-4, or IL-10 capture antibodies included in commercial sandwich ELISA kits (DuoSet ELISA kit; R&D Systems Inc, Minneapolis, MN, USA), washed three times with PBS, blocked with culture medium (200 μl/well) for at least 1 hour at room temperature, and finally washed once again with PBS. All steps were done under sterile conditions. The standard cytokines included in the ELISA kits were added to their respective plates in accordance with the manufacturer's instructions and the plates were then incubated for another 24 hours at 37°C in 5% CO2. Further procedures to quantify the amount of cytokines secreted by the spleen cells during the incubation time were performed as described in the protocols of the respective ELISA kits. The frequency of IgG anti-BCII antibody-forming spleen cells was measured with an enzyme-linked immunospot assay (ELISPOT) in nitrocellulose-bottomed 96-well plates (MultiScreen-HA; Millipore, Billerica, MA, USA). Wells were coated overnight at 4°C with BCII (10 μg/ml in PBS), washed three times with PBS, and blocked with complete medium (200 μl/well) for at least 1 hour at 37°C. Spleen cells, adjusted to 5 × 106/ml and serially diluted 1:3 in three steps in culture medium, were then seeded out in duplicate wells (200 μl/well) and incubated overnight at 37°C in 5% CO2. After that, the plates were washed twice with PBS and three times with 0.05% PBS–Tween 20 (PBS-T). Then 100 μl of biotinylated goat anti-mouse IgG antibody (1:5000 in PBS-T; Jackson ImmunoResearch, West Grove, PA, USA) was added to each well and incubated for 2 hours at 37°C. Thereafter, the plates were washed four times with PBS, and 100 μl horseradish-peroxidase-conjugated biotin–avidin complex solution (diluted in PBS in accordance with the manufacturer's instructions) (StreptABComplex/HRP; DAKO, Glostrup, Denmark) was added and incubated in the dark for 1 hour at room temperature. To reveal the peroxidase staining, 100 μl of filtered 3-amino-9-ethylcarbazole (25 mg), dimethylsulfoxide (2 ml), sodium acetate buffer (0.02 M, pH 5.5; 42 ml), and hydrogen peroxide (30%; 20 μl) were added. When spots appeared, the wells were thoroughly rinsed under tap water and then air-dried. The spots, each one corresponding to one antibody-forming cell, were counted under a stereomicroscope (SZ4045TR; Olympus, Tokyo, Japan), and data were adjusted to numbers of spot-forming cells per 107 spleen cells. IgG, IgG1, IgG2a, and IgG2b antibody activities against BCII and IgG anti-OVA antibodies in serum were measured by an ELISA in flat-bottomed 96-well plates (Nunc-Immuno plates; Maxisorp). Wells were coated for 6 hours at 4°C with BCII (10 μg/ml in PBS) or OVA (5 μg/ml in PBS). After three washings with PBS-T, serum samples were optimally diluted in PBS-T and incubated overnight at 4°C. This was followed by four PBS-T washes. Biotin-conjugated anti-mouse IgG (1:100000; Jackson ImmunoResearch), IgG1 (1:20000), IgG2a (1:10000), or IgG2b (1:10000) antibodies (BD Pharmingen, Heidelberg, Germany) in 100 μl PBS-T were added for 2 hours at room temperature. Plates were washed four times in PBS-T and incubated with 100 μl ExtrAvidin–alkaline phosphatase conjugate (1:20000; Sigma E2636) for 2 hours, followed by another four washes. Then 100 μl of the substrate p-nitrophenyl (104 Sigma), 1 mg/ml, dissolved in diethanolamine buffer, pH 9.8, was added. The absorbance was read on a Spectra MAX 340 at 405 nm (Molecular Devices, Sunnyvale, CA, USA). All incubations were performed in a humid atmosphere and the washings were made with an ELISA washer (Skatron SkanWasher 400; Skatron Instruments AS, Lier, Norway). The antibody activity against the coated antigen was expressed in arbitrary ELISA units calculated by interpolation in the linear range of a standard curve made from a pool of positive samples run on each plate. The Mann–Whitney U test was used for analyses of differences in antibody activities, numbers of antibody-forming cells, arthritic scores, and the progression and onset of arthritis. Student's t-test and two-way analysis of variance was used for comparison of weight changes and spleen-cell proliferation and cytokine secretion in vitro. P values less than 0.05 were considered significant. DBA/1 mice were fed OVA or a standard diet ad libitum for a week. Mice fed the OVA diet had significantly lower IgG antibody activity to OVA (Fig. 1a). The OVA-specific splenocyte proliferation in vitro (Fig. 1b) was also lower than in mice fed a standard diet. The splenocytes from mice fed OVA before coimmunization with OVA and BCII also secreted significantly less IFN-γ (Fig. 1c), IL-4 (Fig. 1d), and IL-10 (Fig. 1e) after restimulation with OVA in vitro than mice fed a standard diet. Effects on ovalbumin (OVA)-specific immune responses in mice fed OVA. Mice were fed OVA or a standard diet for 7 days. One week after the last day on the OVA diet, the mice were immunized with OVA or OVA mixed with bovine collagen type II (BCII) emulsified in Freund's complete adjuvant. Three weeks later the mice were immunized again, with the same antigen(s) emulsified in Freund's incomplete adjuvant. (a) IgG anti-OVA antibody activity in serum 1 week after the booster immunization. Each circular symbol represents one mouse and the bars represent the median values. Data were compared using the Mann–Whitney U test. In vitro proliferation (b) and secretion of IFN-γ (c), IL-4 (d), and IL-10 (e) by splenocytes after OVA restimulation 1 week after the booster immunization. The proliferation results are presented as proliferation indexes (mean counts per minute [cpm] in triplicate cultures stimulated with OVA/mean cpm in triplicate control cultures). Bars represent mean ± standard error of the mean (n = 7–9). *P < 0.05, **P < 0.01, ***P < 0.001 (Student's t-test). Ag(s), antigen(s); C, bovine collagen type II; O, ovalbumin; Od, ovalbumin-containing diet; Sd, standard diet. Arthritis was induced in OVA-fed and standard-fed mice by two immunizations with an arthritogenic inoculum containing either BCII or BCII mixed with OVA. One week after the booster, the frequency of IgG anti-BCII antibody-forming cells in the spleen and IgG anti-BCII antibody activity in sera were determined. Mice fed the OVA diet prior to coimmunization had significantly fewer IgG anti-BCII antibody-forming cells in the spleen than coimmunized mice not fed the OVA diet or mice immunized with BCII alone (Fig. 2a). The IgG anti-BCII antibody activity in sera was also significantly reduced (Fig. 2b). Standard-fed mice that were coimmunized with BCII and OVA had significantly higher IgG1 anti-BCII antibody activity than similarly fed mice immunized with BCII alone or than mice fed OVA prior to coimmunization (Fig. 2c). Regardless of the feeding regime, the IgG2a antibody responses to BCII were significantly lower in mice coimmunized with BCII and OVA than in mice immunized with BCII alone (Fig. 2d). Effects on anti-bovine collagen type II (BCII) antibody responses in mice fed ovalbumin (OVA). Mice were fed OVA or a standard diet for 7 days. One week after the last day on the OVA diet, the mice were immunized with BCII or BCII mixed with OVA, emulsified in Freund's complete adjuvant. Three weeks later the mice were immunized again, with the same antigen(s) emulsified in Freund's incomplete adjuvant. Numbers of IgG anti-BCII antibody-forming spleen cells (AFCs) (a), and serum IgG (b), IgG1 (c), and IgG2a (d) anti-BCII antibody activity, 1 week after booster immunization. Each symbol represents one mouse and the bars represent the median values. Data were compared using the Mann–Whitney U test. *P < 0.05, **P < 0.01, ***P < 0.001. Ag(s), antigen(s); C, bovine collagen type II; O, ovalbumin; Od, ovalbumin-containing diet; Sd, standard diet. Splenocytes were restimulated with BCII in vitro 1 week after the booster immunization. Mice coimmunized with BCII and OVA had significantly lower BCII-specific splenocyte proliferation in vitro than mice immunized with BCII alone, irrespective of whether they were fed OVA (Fig. 3a). We also measured the secretion of IFN-γ, IL-4, and IL-10 to determine the effector function of the splenocytes. Splenocytes from coimmunized mice that were fed the standard diet secreted significantly more IFN-γ after restimulation with BCII in vitro than splenocytes from the other groups of mice (Fig. 3b). The IL-4 secretion after BCII restimulation in vitro was not influenced by the different in vivo treatments (Fig. 3c). Splenocytes from mice fed OVA prior to the coimmunization secreted significantly less IL-10 after restimulation with BCII in vitro than splenocytes from coimmunized mice not fed OVA, but significantly more than splenocytes from BCII-immunized mice fed OVA (Fig. 3d). Effects on bovine collagen type II (BCII)-restimulated spleen-cell cultures from mice fed ovalbumin (OVA). Mice were fed OVA or a standard diet for 7 days. One week after the last day on the OVA diet, the mice were immunized with BCII or BCII mixed with OVA, emulsified in Freund's complete adjuvant. Three weeks later the mice were immunized again, with the same antigen(s) emulsified in Freund's incomplete adjuvant. In vitro proliferation (a), secretion of IFN-γ (b), IL-4 (c), and IL-10 (d) by splenocytes after BCII restimulation 1 week after the booster immunization. The proliferation results are presented as proliferation indexes (mean counts per minute [cpm] in triplicate cultures stimulated with OVA/mean cpm in triplicate control cultures). Bars represent mean ± standard error of the mean (n = 8–9). *P < 0.05, **P < 0.01, ***P < 0.001. Ag(s), antigen(s); C, bovine collagen type II; O, ovalbumin; Od, ovalbumin-containing diet; Sd, standard diet. Mice fed the OVA diet before coimmunization with BCII and OVA and killed 1 week after the booster injection had a significantly greater increase in body weight (Fig. 4a) than the mice in the other experimental groups, which lost weight. Importantly, the OVA-fed coimmunized mice had a significantly lower arthritic score at this time (Fig. 4b). The results in Fig. 4b also show that the inclusion of OVA in the arthritis-inducing BCII inoculum had an ameliorating effect on the severity of arthritis 1 week after the booster. Hence, the coimmunized mice had significantly lower arthritic scores at this time than the mice immunized with BCII alone. When the arthritic score was compared between arthritic mice alone, the coimmunized mice had a significantly reduced arthritic score in comparison with BCII-immunized mice, regardless of the feeding protocol (not shown). However, when the progression of arthritis was followed in surviving animals over a longer observation period, the severity of arthritis in mice immunized with BCII and OVA, but not fed OVA, eventually reached the same level as in mice immunized with BCII (Fig. 4c and Table 1). 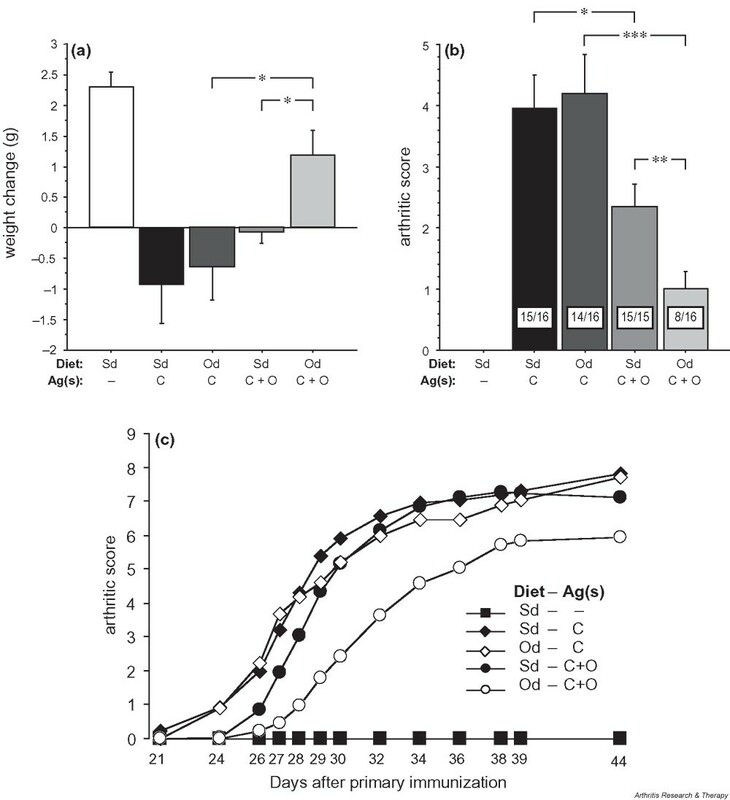 The mice fed the OVA diet prior to the coimmunization had a significant reduction in the progression of arthritis in comparison with the control groups during the whole observation period (Fig. 4c and Table 1). The day of arthritis onset was also significantly later in mice fed the OVA diet prior to the coimmunization than in coimmunized mice not fed the OVA diet or mice immunized with BCII alone (Table 1). However, at the end of the observation period, all the mice in all the experimental groups had arthritis (not shown). Although mice fed the OVA diet prior to coimmunization had a reduced maximum arthritic score (Table 1), they differed significantly only from mice fed the OVA diet and immunized with BCII. 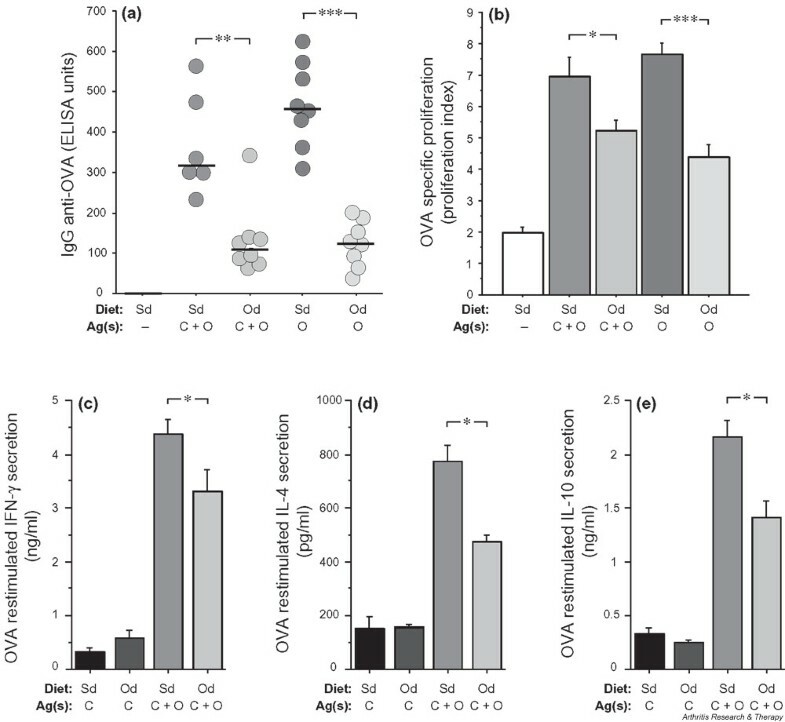 These results indicate that OVA-specific regulatory events induced by OVA feeding ameliorated arthritis development when OVA was included in the disease-causing inoculum. Clinical manifestations of arthritis in mice fed ovalbumin (OVA). Mice were fed OVA or a standard diet for 7 days. One week after the last day on the OVA diet, the mice were immunized with BCII or BCII mixed with OVA, emulsified in Freund's complete adjuvant. Three weeks later, the mice were immunized again, with the same antigen(s) emulsified in Freund's incomplete adjuvant. (a) Body weight change in mice (n = 7–9), from the day of primary immunization to 1 week after booster immunization. (b) Arthritic score 1 week after booster immunization. Bars represent mean ± standard error of the mean. The figures inside the bars in (b) show the number of arthritic mice per the total number of mice in each experimental group. (c) Progression of arthritis. Each symbol represents the mean arthritic score (n = 15–16) at the indicated day. Results from two separate experiments were calculated together in (b) and (c). Body weight changes were analyzed statistically with Student's t-test and arthritic scores, with the Mann–Whitney U test. *P < 0.05, **P < 0.01, ***P < 0.001. Ag(s), antigen(s); C, bovine collagen type II; O, ovalbumin; Od, ovalbumin-containing diet; Sd, standard diet. aData were derived from studies of the same mice as used in Fig. 4c. The area under the curve (AUC) represents arthritis progression. Statistical analysis was with the Mann–Whitney U test. *P < 0.05 versus OVA-fed and BCII-immunized mice as well as standard-fed and BCII + OVA-immunized mice; **P < 0.05 versus OVA-fed, BCII-immunized mice. SEM = standard error of the mean. In the present study, we have examined the possibility of modulating the course of CIA through the utilization of immunological regulatory mechanisms induced by feeding OVA to DBA/1 mice. Our results show that inclusion of OVA in an arthritogenic BCII inoculum reduces the clinical manifestation of arthritis in mice given OVA perorally. The general condition of the mice was also improved: the OVA-fed mice gained weight, while the control groups lost weight. Additionally, we found that inclusion of OVA in the arthritogenic BCII inoculum, by itself, to some extent reduced the severity of CIA. Tolerance to OVA was manifested by reduced serum IgG anti-OVA antibody activities and lowered OVA-specific spleen-cell proliferation as well as lowered secretion of IFN-γ, IL-10, and IL-4 after OVA restimulation in vitro in OVA-fed animals. It is well documented that autoantibodies to CII play an important role in the development of CIA. For instance, B-cell-deficient mice are resistant to CIA . Anti-CII-specific antisera and monoclonal anti-CII antibodies induce arthritis in naive recipients [11, 16]. In addition, a severe course of murine arthritis is correlated especially with high IgG2a anti-CII antibody levels in sera . This observation is consistent with our results. Indeed, the OVA-tolerized mice that were subsequently coimmunized with a mixture of BCII and OVA had reduced arthritis and a decreased number of splenic IgG anti-BCII antibody-producing cells and serum IgG2a anti-BCII antibody activity. Furthermore, we found that inclusion of OVA in the arthritogenic inoculum reduced the IgG2a anti-BCII antibody activity regardless of the feeding regime. 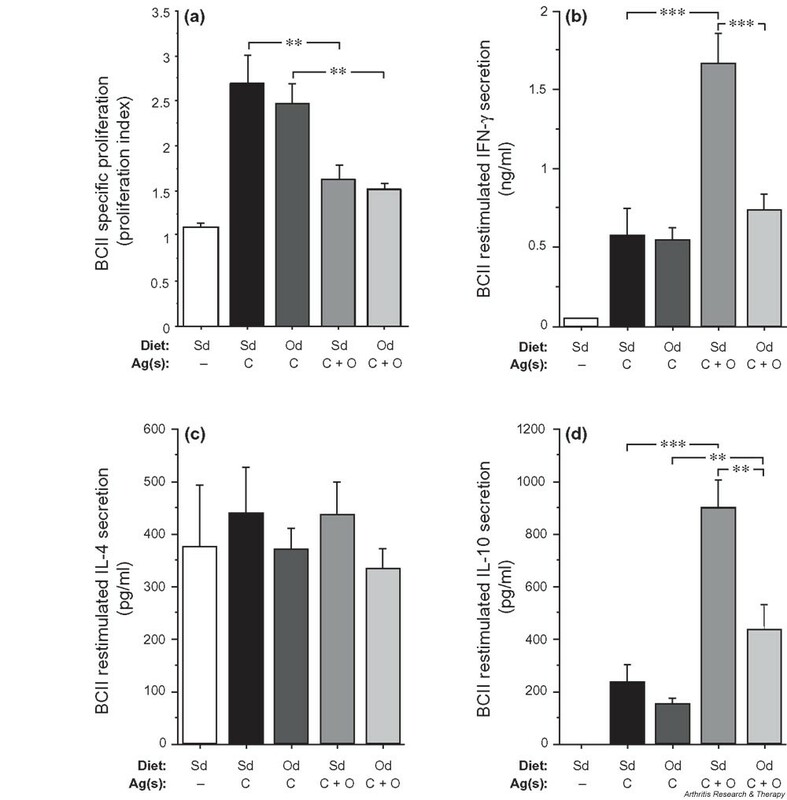 Conversely, the serum level of IgG1 anti-BCII antibodies was enhanced in mice fed the standard diet but not in mice fed the OVA diet prior to coimmunization. These observations suggest that OVA feeding of mice subsequently immunized with a mixture of BCII and OVA led to decreased IgG2a anti-BCII antibody responses followed by amelioration of arthritis. It is widely known that the most potent IgG subclass to activate the classical complement cascade is IgG2a . It is also the best activator of Fc-receptor-bearing macrophages . Earlier studies have indicated that induction of CIA involves initiation of an inflammatory process via the classical complement pathway and also via binding of IgG immune complexes to certain Fcγ receptors on leukocytes [20, 21]. OVA feeding prevented the increase of IgG1anti-BCII antibody activity, which was seen in the group of mice coimmunized with BCII and OVA but not fed OVA. The presence of IgG1 anti-BCII antibodies might have contributed to the late outcome of arthritis in these animals, eventually reaching the same level as in the control mice. The finding that inclusion of OVA in the arthritogenic inoculum delayed the progression of CIA is partially congruent with the findings of a previous study  which showed that DA rats could be protected from rat CIA by addition of an unrelated antigen to the arthritogenic inoculum. This protection was long-lasting and disease-specific. In our study, the severity of arthritis in coimmunized mice not fed OVA eventually reached the level of the controls. The anti-BCII IgG antibody subclass profile in the coimmunized mice points to a shift in Th1/Th2 cytokine balance, at the induction site, favoring IgG1 and disfavoring IgG2a. IgG2a responses are driven by help from Th1 cells secreting IFN-γ, whereas IgG1 responses need help from Th2 cells secreting IL-4 . A recent study has shown that Th1 cytokines are required during the induction phase of CIA, while Th2 cytokines prevent CIA . Hence, tilting the immune response from Th1 to Th2 protects against arthritis development. When we measured the cytokine secretion by spleen cells after BCII restimulation in vitro, we found that splenocytes from coimmunized mice secreted more IFN-γ, but not IL-4, than splenocytes from BCII-immunized mice. Hence, the shift in anti-BCII IgG subclass antibodies cannot be explained by an increased capacity of BCII-specific cells to secrete IL-4. However, OVA-stimulated splenocytes from coimmunized mice secreted more IFN-γ, IL-10, and IL-4 in vitro than splenocytes from BCII-immunized mice. This suggests that an OVA-specific secretion of IL-4 influenced the BCII-specific B cells to increase production of IgG1 and decrease production of IgG2a antibodies. Mice coimmunized with BCII and OVA had decreased BCII-specific splenocyte proliferation in vitro, irrespective of whether the mice were fed OVA. This finding indicates that the reduced proliferation was mainly due to the inclusion of OVA in the arthritogenic inoculum and not necessarily to events induced by OVA feeding prior to coimmunization. 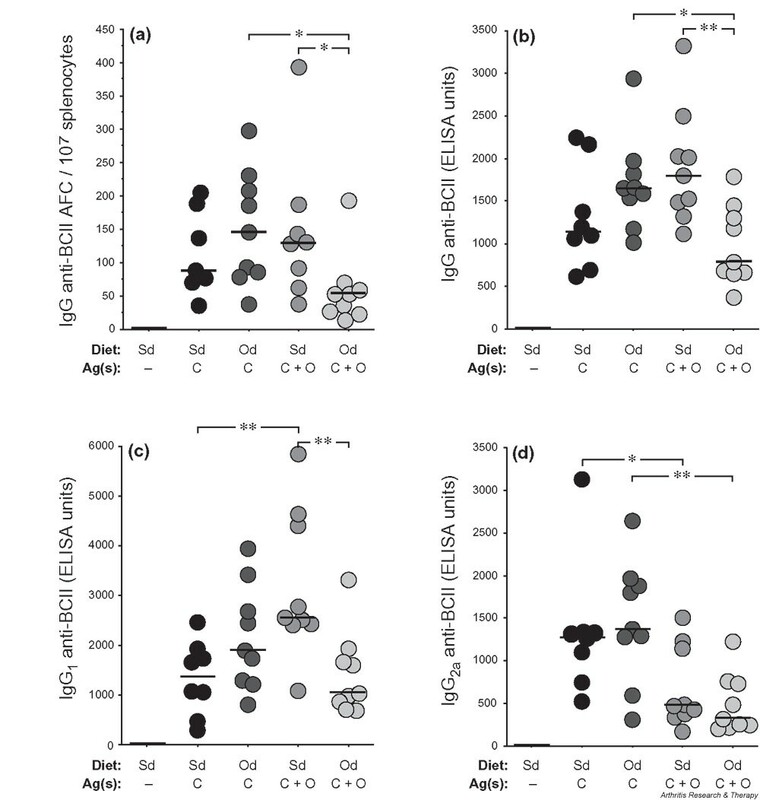 The IFN-γ and IL-10 secretion in BCII-restimulated splenocyte cultures was, on the contrary, increased because of the inclusion of OVA in the arthritogenic inoculum. However, splenocytes from OVA-tolerized mice secreted less IFN-γ and IL-10 in comparison with splenocytes from mice not fed OVA prior to coimmunization. The cytokine profile was also altered, since the IFN-γ / IL-4 ratio was decreased. Thus, regulatory mechanisms induced by OVA feeding seemed to be able to down-regulate the BCII-specific immune responses in vitro and also shift it to a more Th2-like immune response. IL-10 secretion was higher in the coimmunized mice than in the animals immunized with BCII alone. This observation suggests that IL-10 might be involved in the reduced immune response to BCII. Emulsifying BCII and OVA in Freund's complete adjuvant results in competitive interactions for space between BCII- and OVA-specific T-cell subtypes during antigen presentation. Competition also exists at the level of protein processing and peptide loading onto a limited number of MHC molecules [25–27]. However, our results are probably not caused by antigenic competition, since a maintained down-regulation of arthritis was seen only in animals tolerized to OVA prior to the coimmunizations. A more likely explanation for the down-modulation of arthritis is bystander suppression mediated by regulatory T cells specific for OVA. Indeed, other studies have shown that experimental autoimmune encephalomyelitis and experimental autoimmune neuritis can be down-regulated by OVA-driven bystander suppression after oral administration of OVA [28, 29]. Oral tolerance has earlier been described to occur either through active suppression, anergy, and/or clonal deletion of antigen-reactive cells . It has been reported that the induction of deletion or active suppression by oral administration of a protein antigen is dependent on the dose of antigen fed. High doses of orally administered antigen are thought to induce deletion but not active suppression [30–32]. With our standard feeding regimen, the daily intake of OVA is high. However, our observations cannot be explained by clonal deletion of OVA-reactive cells, since that would not influence the immune response to BCII. An increasing number of studies show that oral tolerance to protein antigen induced by feeding an antigen-containing diet ad libitum is, at least partly, a result of active suppression [1, 8, 33, 34]. It may at present be difficult to see an immediate use of the present results in a clinical situation where inflammation is already established in the joint. Several recent studies have shown the presence of CD25+ regulatory T cells releasing suppressive cytokines that may influence nearby cells in humans [35–37]. The present study shows that antigen-specific activation of regulatory T cells produces an antigen-unspecific effect. Hence one can speculate that joint inflammation in humans could be reduced through activation of known regulatory cells by local injection of an antigen to which these cells are specific. Regulatory T cells might be naturally occurring cells specific for self proteins or they may be induced by feeding a protein. From preliminary studies, we have results that support this suggestion, since we have seen that injection of OVA into the joints of OVA-fed mice reduces inflammation. In general, it can be hypothesized that detailed understanding of the immunoregulatory mechanisms associated with the gut lymphoid tissue may enable us to utilize this natural system to treat or prevent the development of autoimmune diseases. The rationale for developing strategies that target the immunoregulatory capacity of the gut is that such strategies may well prove to be associated with a minimum of side effects. We have demonstrated that oral tolerance induced to a protein antigen fed ad libitum is maintained, at least partly, by active suppression. The suppressive mechanisms induced by the fed antigen delayed onset and reduced progression of BCII-induced arthritis. These results encourage further studies, to evaluate the possibilities of modulating arthritis by bystander suppressive mechanisms and to further define the underlying mechanisms. We thank Christina Eklund for continuous support and excellent technical assistance. This work was supported by grants from the Swedish Research Council, grant number K2003-74X-14054-03A; the Swedish Rheumatism Association; the Göteborg Rheumatism Association; and King Gustaf V's 80-Year Foundation.